I promise no more gear talk for a while. At least not as in-depth as that last post. 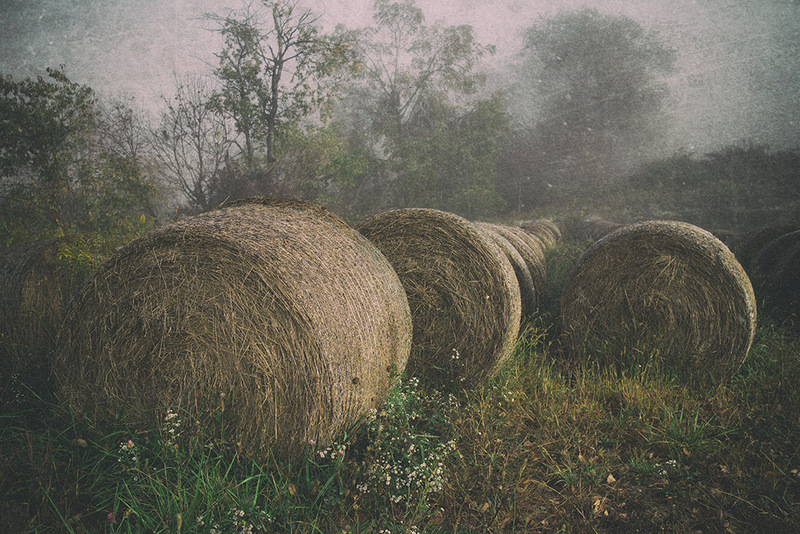 Let’s get back to images starting with some hay bales I spotted in the fog this morning. Cliché I know, but it’s autumn! I’m sure you can’t wait for the obligatory pumpkin pictures! 😉 For the record though I did shoot this with the Canon. These kind of scenes are ideal for the semi-wide focal length. Straight out of the camera the images looked quite painterly (I know, another cliché) so I added a bit of texture during processing to enhance the fact. One thing I did notice was that I seem to be favoring darker pictures of late. Edging the exposure and my processing a hair darker while trying not to be out-and-out underexposed. I like what I’m seeing and I spend a LOT of time just viewing my photos during and after processing to strike a right balance. I know I shoot “normal” stuff but I try to make it look as good and interesting as possible.